I took my telescope out for a bit this evening and managed to get a good view of the moon, the stars Betelgeuse and Sirius, and M42 (also known as the Orion Nebula). 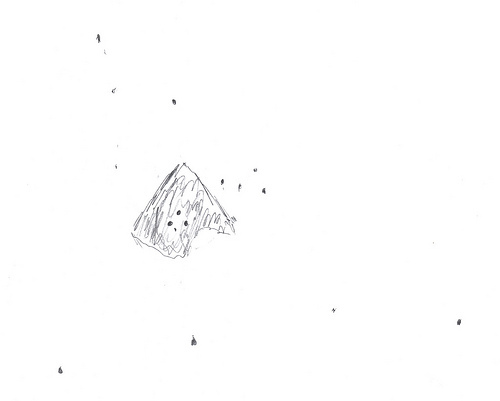 I managed to get a very nice view of the Orion Nebula and I decided to make a sketch of what I saw. This is from a 6 inch f/8 Newtonian reflector with a 12.4mm lens. I could clearly see the Trapezium (the four stars in the center of the nebula). Unfortunately, since this was in my front yard, and because we have a streetlight right next to our house (! ), I was only able to see a bit of the nebula (the shaded in area) and all of it greyscale. At some point, I need to get the motor on my equatorial mount working so that I can try my hand a deep space astrophotography. What kind of mount do you have? I used to have a similar 6 inch on a Dobson mount, loved it. Now I have a small refractor, on a simple alt-az mount equipped with simple setting circles. The computer makes it possible to find just about anything with that. Nice drawing, btw! It's an equatorial mount. The mount itself has a motor on it, but I need to refurbish the clutch on it because although the motor works, it doesn't actually move the telescope.